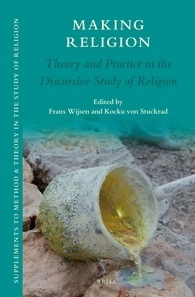 Discursive approaches to the study of religion have received a lot of attention recently. Making Religion brings together leading theorists in the field who explore the theoretical and practical dimensions of the analysis of religious discourse. The volume provides an overview of current debates in the field, extends and improves upon contemporary theories and methodologies, and contributes to the discipline more broadly by flagging the importance of this emerging field of research. The combination of theoretical reflection and practical application of discourse analysis as a tool to study religion opens up new perspectives for future research.